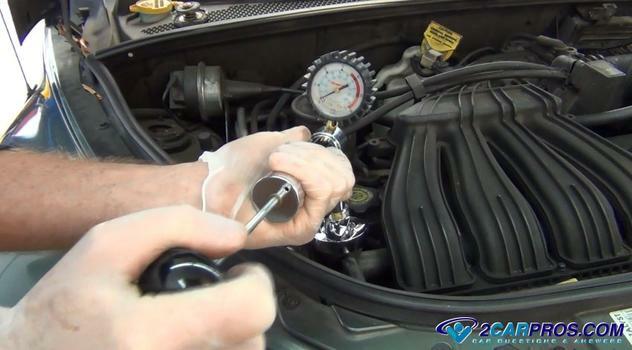 A radiator or cooling system pressure test is useful when finding a radiator leak or a blown head gasket. This tool attaches to the top or the radiator or coolant reservoir and enables air pressure to be pumped into the system including the engine block, cylinder heads, coolant hoses, heater core and radiator. This pressure simulates the engine getting hot and expanding the coolant which in turn builds pressure in the system. Most kits you can get from Amazon for between $45.00 and $75.00 (US) which will include the adapters to attach to the many different radiator caps for testing for each manufacturer. If you were to have this test done at a repair shop it would cost between $95.00 and $140.00 (US). 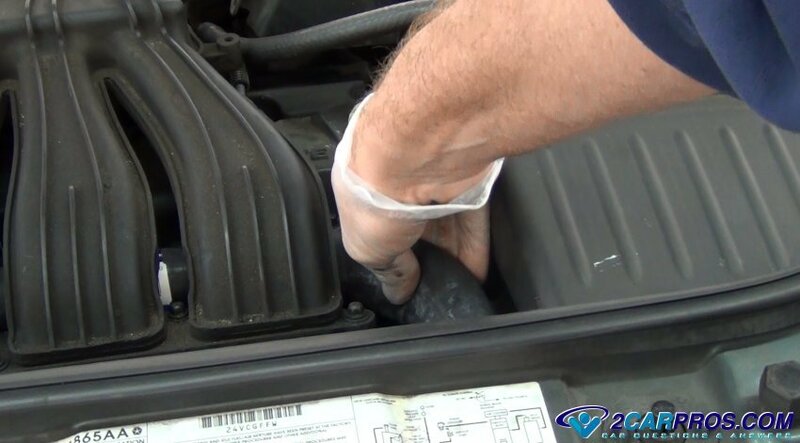 It's best to start with the engine cool and the car parked on dry ground so you can more easily see where the leak is coming from. If the cooling system is low or empty refill it with water before the test begins. Fill the system carefully as not to spill any water so it will be easier to detect the leak. You should also where gloves and protective eyewear. A video for this test is featured at the bottom of this guide. 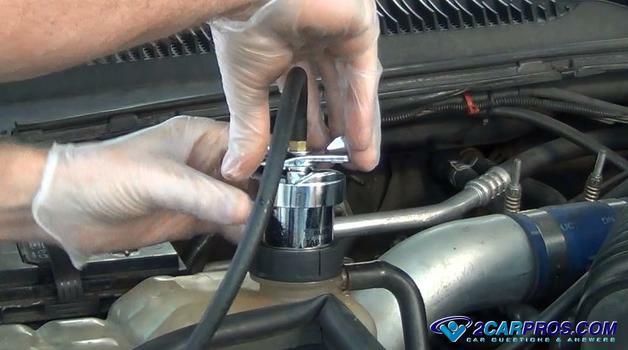 Before removing the radiator cap its best to see if the system is already pressurized. 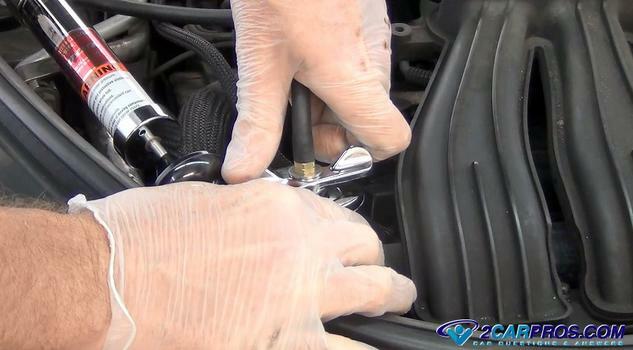 This can be done by simply squeezing the upper radiator hose to check for pressure in the system. Grasp the upper hose and push you thumb into the hose to check the resistance. 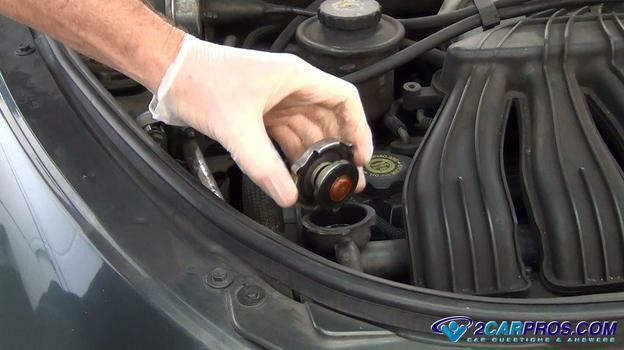 If the system does have pressure slowly remove the radiator cap, in most cases it won't. 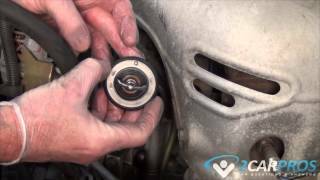 Once you have determined the system has little to no pressure inside slowly remove the radiator cap. This will enable you to attach the pressure tester. Open the pressure tester's case and inspect the unit. 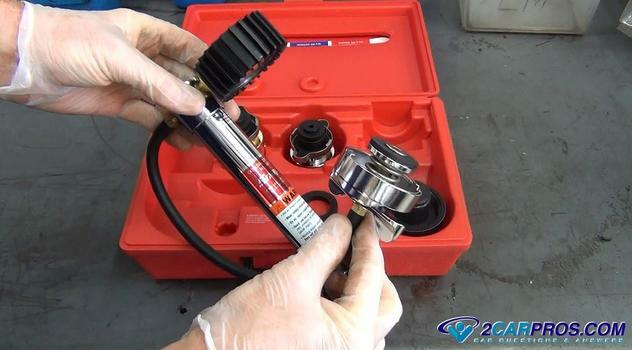 You want to make sure it is in good working order and free from leaks in the hose and that the gauge is easily seen. On traditional radiators the pressure tester will connect directly to the radiator without using an adapter. For all other applications you will need to use an adapter which will be supplied in the pressure tester kit in most cases. 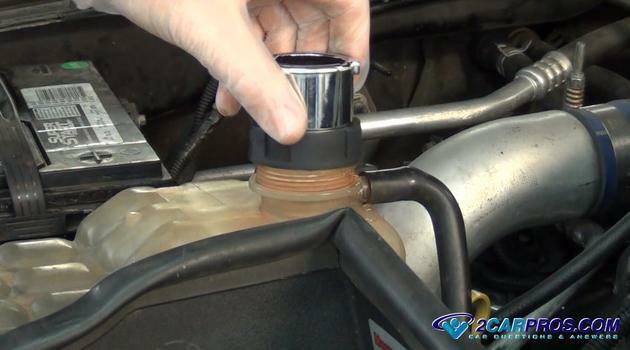 Choose the correct adapter for your application and attach it to the radiator or coolant reservoir. The pressure tester connector will be spring loaded so push downward before you start twisting the connector and lock clockwise. You should feel a click as the tester secures itself to the adaptor or radiator. This is what it looks like when there is no adapter required to attach the pressure tester to the cooling system. Grasp the pressure tester and pump the plunger rapidly to build pressure inside the system, much like you are pumping air into a tire. You will notice the needle on the pressure tester gauge start moving upward as it measures the pressure inside the system. At this point you may see coolant leaking from the engine, radiator or hose. This test is also good for checking a blown head gasket once all of the spark plugs have been removed. Keep pumping the plunger until the pressure gauge reads about 14 pound of pressure. If you cannot get the system to hold pressure chances are coolant is pouring out of a leak somewhere or the pressure tester is not attached properly, recheck the tester connection. Avoid pressure above 18 pounds so you do not damage the cooling system by causing a rupture. 18 pounds is the pressure most radiator caps hold. 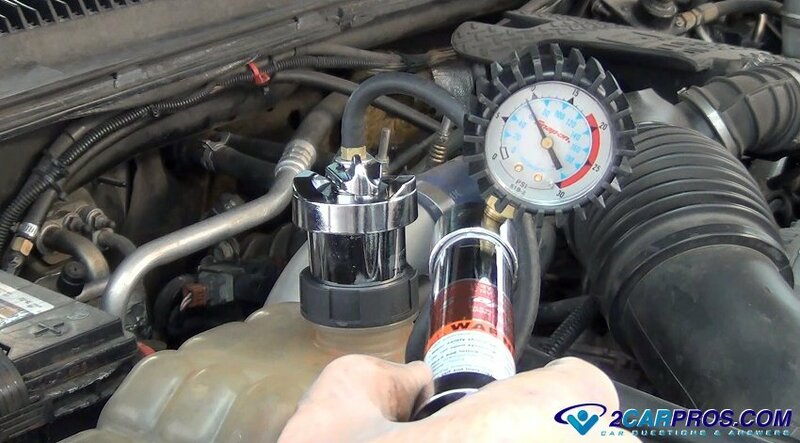 Your pressure tester should have an adapter to test the radiator cap as well which is a good idea to keep the engine from overheating. Once the test is complete slowly remove the pressure tester by twisting the connector lock counterclockwise. You will hear a pressure release signaling the tester is ready to be removed. It will be normal for coolant or water to be expelled from the connector at this time. Clean and reinsert the tester back into its case and store it in a cool dry place until you need it again. 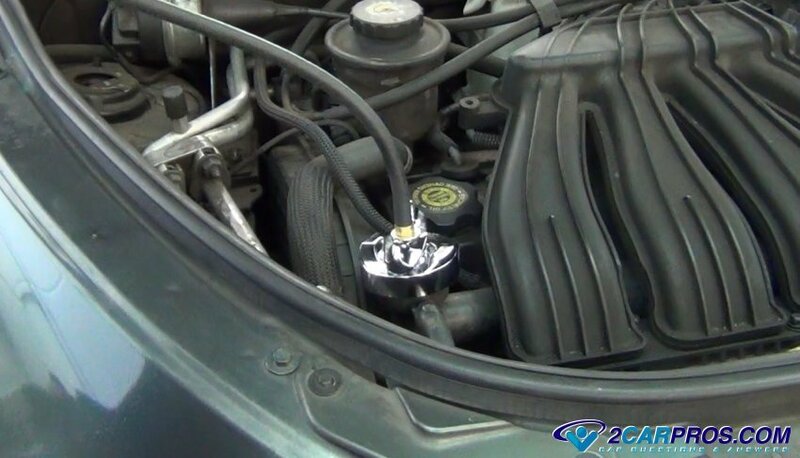 If you have any questions about coolant leaks, please visit our forum. If you need car repair advice, please ask our community of mechanics who are happy to help. Our service is always 100% free.